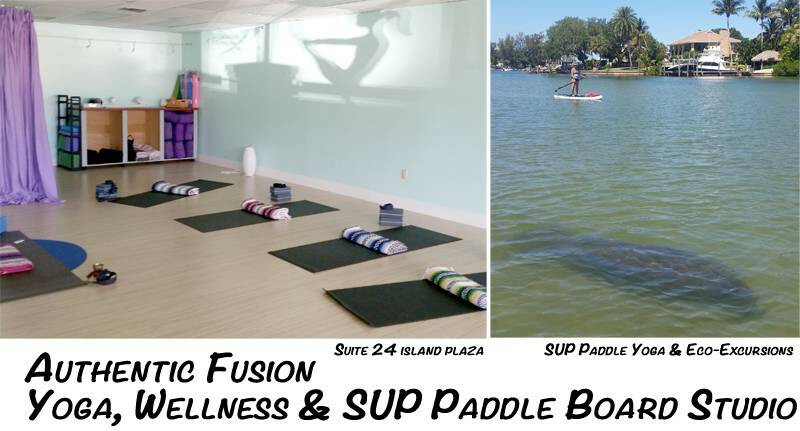 Authentic Fusion Yoga, Wellness & Paddle Board Studio is a Boutique Yoga, Wellness & Paddle Studio with activities for the entire family offering personalized attention both in the studio or at the location of your choice. Join our regularly scheduled Small Group Classes, Wellness Workshops and Retreats or schedule a Private Lesson. We can help guide you to deeper awareness, wellness and joy through Yoga and Kundalini yoga, The Goddess Yoga Experience, SomaVeda® Thai Yoga, TRX Strength Training, Stand Up Paddle Boarding, Dance and Energy Work. Whether you want to improve your balance, drop 10 pounds, reduce stress, relieve chronic pain, reduce medications, increase flexibility, prepare for a pregnancy, keep yourself and your children active & healthy, grow stronger, improve your diet, sleep better, discover Yoga or try out paddle boarding we can help! Call Lynne today to schedule your complimentary consultation at 941-237-6318.